← Slop bin on tour: Used it yet? 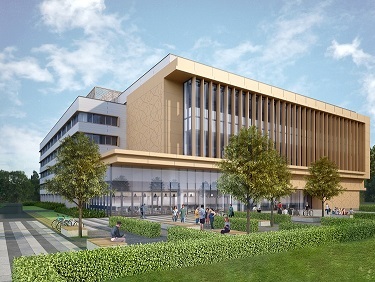 The University has appointed the award-winning firm, ISG Fit Out Ltd. as the contractor for the Library refurbishment. Our Procurement and Estates & Facilities teams collaborated to select ISG Fit Out as the best contractor for this project, based on their competitive costing, quality assurance and technical suitability. We will now be working with ISG Fit Out to share detailed outlines of the redevelopment, including early works taking place this summer. This major redevelopment continues the popular refurbishments of the upper Library floors carried out in 2013–2014, and will deliver further benefits and improvements for you. On the Ground and First floors, study space will be increased, security will be improved, an improved service for borrowing and returning books will be put into place and the café space will be extended. Throughout the building, new lifts will be installed to provide better disabled access, additional toilets will be added and energy services (including heating and ventilation) will be optimised. The Library will remain open and fully operational throughout the redevelopment. Important information about the project, such as the provision of alternative study space and notice of disruptive works will be shared with you all at the earliest possible time. See an indicative overview of the project and further details of the redevelopment at www.reading.ac.uk/library/refurb. Please remember to check back regularly for new project updates here or on the University Library News blog where day-to-day advice will be given to Library users throughout the project. This entry was posted in General news, Refurbishment, Study Space, Vacation information. Bookmark the permalink.